2018 has been a typical Texas Coastal Spring Season. Some days we have sunny skies, 80 degrees temperatures, warming waters, and get the hint that summer is approaching. Other days are just the opposite… 25mph chilly north winds, falling water temperatures – and we wonder if winter will ever be over. These weather changes simply mean one thing – it is Spring Time on the Texas Coast. Great things are happening. We have had some amazing Galveston Fishing Reports come in the past couple of weeks. 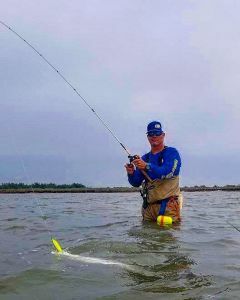 Our Galveston Fishing Guides have been fishing many different areas of our Bay system and making some great trips in some less than ideal weather conditions. The Galveston Jetties are still seeing Bay Snapper spawning along the rocks. This annual spawn should be in its final stages. The Bay Snapper will be replaced with spawning speckled trout in the next couple of weeks. We are also seeing some nice redfish caught along both the north and south jetties. Live shrimp freelined along the jetties are working best. Just this past week we have seen schools of jack crevelle moving through the jetties and passes. This is a sure sign that summer is around the corner. Also, this means that our Galveston Shark Fishing Charters will be in full swing in the not so distant future. The back lakes and marshes have been very good for redfish and speckled trout. Live shrimp fished under a popping cork has been working best. 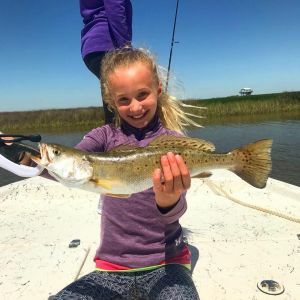 Also, we are catching some very nice speckled trout and slot reds wade fishing with top waters and soft plastics when we have customers that want to get out of the boat and wade fish. Great things are happening here in Galveston, and we are very excited about the coming summer. We still have opening for our Galveston Kids Summer Fish Camps. Click here for more details. Also, we now offer lodging for our anglers. Water front lodging at Bay’s Landing. At only $200 per night and will sleep up to eleven guests – you just cant beat it! Just this past week we heard great news! Amberjack season will open on May 1 thru May 31. This is awesome news, and we are ready to get offshore and catch some amberjack, kingfish, mahi, cobia and more! 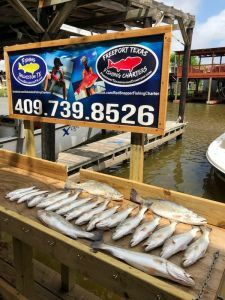 Give Captain Greg a call and book your inshore, offshore, flounder gigging, kids camp, or night time speckled trout trip today!